Your kitchen doesn’t need a Matterhorn vista to stay on top of the latest “chalet chic” design trend. It’s easier than you think to get this style by mixing rustic pieces with modern touches. “Exposed structural elements work well when paired against something that’s more delicate,” says David Bourke, architect and builder behind the 2014 HGTV Dream Home. Located in California just outside of Lake Tahoe, this year’s home was inspired by its surroundings: raw wood blends seamlessly with streamlined appliances and a bevy of windows to create a space that feels both cozy and bright. The good news: You don’t need to build a custom home to recreate this look. Through some simple updates and inexpensive additions, you can bring this same mountainside style into your home, creating a kitchen that feels both on-trend and timeless. Cool finishes, like chrome and stainless, complement the mountain modern design theme, popping against natural backdrops without competing for attention. While replacing all of your appliances may not be feasible, swapping out some of your kitchen’s fixtures is a cost-effective way to achieve this same result. The Delta Trinsic faucet, which boasts a streamlined design, comes in a variety of finishes that juxtapose well with woodsy accents. Available with optional Touch2O Technology, this faucet’s water flow can be activated with a simple touch anywhere on the spout, hub or handle. Bring the outside in through inexpensive accents. Natural wood trays, stone tableware or reclaimed artwork can help make a big impact with minimal investment. “We added rustic wood frames around mirrors that were originally too small for the space to help create balance,” says Linda Woodrum, designer behind the 2014 HGTV Dream Home. The home’s kitchen also features organic accents on open shelving, while the island continues to help bring this concept to life through the incorporation of live vegetation, wooden cutting boards and wicker platters. Take this concept a step further in your own home by incorporating materials from your own backyard. Wildflowers, pinecones and even leaves make chic centerpieces for each season. 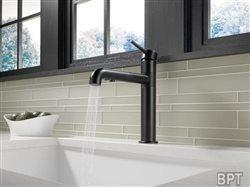 For more mountain makeover tips and resources to outfit your space, visit Inspired Living at www.deltafaucet.com. Sometimes making your kitchen feel current is as simple as switching up an outdated color scheme. Pick just one cheerful color to brighten up your outdoorsy neutrals. Chartreuse, mustard yellow and vibrant orange all work well when used sparingly throughout your decor.